Choose and click on the Special Test among the list to see the Procedure, Positive Sign and Purpose of the assessment. In physical orthopedic examination, special tests are used to rule in or rule out musculoskeletal problems. You may also keep scrolling down to view all the Special Tests. Patient abducts arm to 90°, flexes the elbows to 90°, and rest their dorsal hands on the table. Patient tucks chin, and then lifts head off the table. Weakness of Anterior Neck Flexors if Patient is unable to keep the neck in flexion against gravity or the therapist’s pressure. To asses the strength of the Anterolateral Neck Flexors (SCM and scalene on one side). Patient rotates the head away from the side being tested. Therapist stabilizes the side being tested. Patient lifts the head into slight flexion and hold it against gravity. Patient keeps the head lifted off the table (Grade 3). Therapist holds the temporal region on the side being tested. Therapist pushes in an oblique posterolateral direction, away from the tested side. Weakness of the Anterolateral Neck Flexors if the patient is unable to keep the neck in flexion against gravity or the therapist’s pressure. Patient’s head is in neutral. Carefully apply compression downward on the head of the patient. Radiating pain or other neurological signs in the same side arm (nerve root) and/ or pain local to the neck or shoulder (facet joint irritation). Patient is supine or seated. Patient’s head is in a neutral position at all times throughout the procedure. Therapist grasps the patient’s head at occiput and temporalis. One hand on either side of the head. Slowly traction the patient’s head in a superior direction. Maintain the traction for at least 30 seconds. Patient fully rotates their head away from the side being tested. Patient then fully flexes the head to their chest. Patient has limited neck flexion. The cause for the hypomobilty may be tight scalenes. Patient seated. Patient keeps their eyes closed. Therapist tries to slowly open the patient’s eye on the affected side with their clean hands. Patient cannot keep their eyes closed against therapist’s resistance. Patient extends their neck. Therapist stabilizes the side being tested. Patient then rotates the head towards the side being tested. Patient holds the head in this position. Patient keeps the position against gravity (Grade 3). Therapist holds temporalis area of the unaffected side, then pushes in an oblique posterolateral direction, away from the tested side. weakness of the Posterolateral Neck Flexors if the patient is unable to hold their neck against gravity or the therapist’s pressure. Maxillary Sinus: Patient places the flashlight inside the mouth, against the roof of the mouth. Frontal Sinus: Using a different clean plastic bag, place flashlight against the medial aspect of the eyebrows. Sinuses are infected or blocked if they do not glow red (transilluminate). A normal sijus shows a red glow in the area occupied by the sinus. Patient is seated. Therapist stands behind patient. Patient slowly extends, sidebends, and rotates the head to the affected side. Therapist carefully apply compression downward on the head of patient. Palpate and Pincer grasp SCM. Locate the most tender point. pain may be caused by throat infection, hematoma, bony protruberance of the cervical spine or tumor so patient should be advised to see a medical doctor. Patient can only get one knuckle or knuckles between their teeth. Patientextends their neck. Therapist stabilizes the side being tested. Patient then rotates the head away the side being tested. 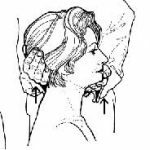 Therapist apply pressure on the posterior head, slightly pushing the head anteriorly and obliquely away from the tested side. Weakness of the Upper Trapezius if the patient is unable to hold their neck against gravity or the therapist’s pressure. Patient complains of dizziness, nystagmus, or both. (Further testing is contraindicated and patient must be referred to a medical doctor). Therapist stands behind the patient. Place cupped hands over the patient’s shoulder, the fingers interlaced. One palm on the clavicle, the other hand on the scapula. Slowly squeeze the heels of the hands together. Frozen Shoulder. Restricted motion at the shoulder caused by fibrosing and adhesion of the axillary fold of the inferior Glenohumeral Joint Capsule. Neurovascular Compression (TOS) caused by the anterior scalene. Patient takes a deep breath and holds it from 15-30 seconds. Patient’s symptoms reoccur (numbness, tingling in hands and fingers) or the patient’s radial pulse diminishes. Neurovascular Compression (TOS) between the clavicle and Rib 1. Patient’s symptoms reoccur (numbness, tingling in hands and fingers)or The patient’s radial pulse diminishes. Neurovascular Compression (TOS) caused by the middle scalene. Recurrence of their shoulder and arm pain. Slowly extend their wrist and fingers and deviate the wrist to the radial side. Neurovascular Compression (TOS) caused by the pectoralis minor. Passively abduct their affected arm to 180°, then slightly extend the arm. Purpose: To find out whether the spinal curvature is functional or structural. Patient actively and slowly extends, sidebends and rotates their thorax and lumbar spine to the affected side. Nerve root compression: Radiating pain or other neurological signs in the affected leg. Purpose: to stretch the spinal cord and the dural tube to reproduce the pain caused by nerve root involvement or meningeal irritation. Patient is supine, with their hands behind their head. Patient actively flexes their head into their chest. Then, with their knees in extension, patient flexes their hip. Mc Burney’s point: two-thirds distance inferiorly along an imaginary line drawn from the umbilicus and the right ASIS. Severe pain when pressure is released. (Symptoms may be accompanied by nausea and low grade fever). This is a medical emergency. Massage is contraindicated with a Positive test result. Observe the patient’s Bilateral Iliac Crests and Acromioclavicular joints levels, and see if there is tilting and scoliosis. Place a thin book under the lower (smaller) pelvis side. Patient actively extends right knee then dorsiflexes the right foot. Do the left side afterwards. Testing for: the presence of a space-occupying lesion (may be tumor, herniated disc, osteophytes) that is increasing the pressure within the spinal canal. Patient is seated and curled forward. Positive Sign: pain local to the lesion site or radiating pain in a dermatomal pattern. Instruct patient to repeat the words “ blue balloons” or “ ninety nine” (low frequency vocalizations). At the same time, therapist places both hands symmetrically over the patient’s thorax, moving them over the lungs and bronchi assessing for the presence of vocal fremitus or palpable vibrations in the lungs. Positive Sign: decreased vibration in areas of the lungs that has congestion. Assess Medial Hamstrings (semitendinosus and semimembranosus) – slightly internally rotate femur. Patient holds this position against gravity (Grade 3 strength). As patient holds the position, therapist attempts to extend the affected knee. Assess Lateral Hamstring (biceps femoris) – slightly externally rotate patient’s femur and holds their knee in 70° flexion against gravity (Grade 3 strength). As patient holds the position, therapist attempts to extend the affected knee. Patient places the plantar surface of their foot on the medial aspect of the knee on the unaffected side. The affected hip is abducted, flexed and internally rotated and their affected knee is flexed. Positive Sign: Patient cannot hold the affected leg off the table (in flexion and slight external rotation). To test Grade 5 Strength, therapist may try to put a downward pressure as the patient tries to keep the leg off the table in resistance. Patient is sidelying close to the edge of the table on the unaffected leg. Therapist stands behind the Patient. With the other hand grasping the medial aspect of the patient’s affected knee, passively hyperabduct and extend the affected femur at the hip. Patient flexes the hip and knee of the affected side, raising their knee as high as they can, while standing on the unaffected side. Therapist apply pressure from lateral to medial (45 °) and then posteriorly. Raise the affected leg by grasping it around the heel and flexing the hip (their affected knee should be extended). Slowly lower the leg until no pain is felt by the patient. Patient is supine , with lower gluteal folds at the end of the table and their hips and knees flexed. Patient may hold the legs in flexion with their hands. Therapist makes sure that the patient’s lower back is not so high off the table. Femur: Then therapist stands at the side of the table to compare the positions of the patellas looking for the shorter femur. Pain over the lateral femoral condyle at about 30° degrees of knee extension. Patella clicks onto the femur and then rebounds to the floating position. This could be caused by torn cruciate ligaments, meniscal tearing, or fracture and is considered a Medical Emergency. (Joint effusion within two hours of injury might be caused by blood in the joint, and joint effusion with synovial fluid usually develops 8 hours after injury. To assess for lesser amounts of synovial fluid within the knee joint right after an injury. This is usually done after the Major Effusion Test comes up negative. A bulge inferior to the patella appears within two seconds, the positive test will indicate from 4-8 millimeters of extra synovial fluid within the joint. This could be caused by cruciate or meniscal damage and is considered a Medical Emergency. Note: The Q angle is the angle between the quadriceps tendon and the patellar tendon. The Q-angle is formed from a line drawn from the ASIS to the center of the kneecap, and from the center of the kneecap to the tibial tubercle. To find the Q-angle, measure that angle, and subtract from 180 degrees. A normal Q angle with the knee extended and the quadriceps muscle relaxed is 18° degrees for women and 13° degrees for men. A Q angle that is greater than normal allows the patella to track laterally, stressing the lateral facets which is associated with patellar tracking dysfunction, chondromalacia patellae and patellar subluxation. Place the affected leg in extension and slight external rotation. The integrity of the structures that prevent lateral instability at the knee (lateral collateral ligament, joint capsule, cruciate ligaments). Patient is supine with the affected knee in full extension. Therapist stabilizes the affected leg in slight external rotation with one hand on the lateral malleolus. Therapist places their other hand on the medial aspect of the knee. Therapist applies a laterally directed (a varus) stress on the medial knee. The integrity of the Anterior Cruciate Ligament (ACL). The Lachman’s test is considered to be the most accurate test for ACL integrity. Therapist applies an anteriorly directed stress the tibia. Pain or excessive anterior motion of the tibia, and disappearance of the infrapatellar tendon slope. Patient expresses apprehension and/ or might try to move their affected knee away from the pressure. As the knee is slowly extended, the Therapist observes the relative alignment of the tibial tuberosity to the midline of the patella. (Therapist can also palpate the movement of the tibial tuberosity). * Since the medial femoral condyle is about 1 cm. longer than the lateral femoral condyle, the tibia first moves over the available lateral condyle surface and then must rotate laterally when we extend the knee. Absense of slight lateral tibial motion = this positive sign may indicate that a torn meniscus or injured cruciate ligament is physically blocking the knee extension. – Pain or tenderness along the medial aspect of the joint line indicates medial meniscus injury. – Pain or tenderness along the lateral aspect of the joint line indicates lateral meniscus injury. Therapist compresses the flexed knee joint and the menisci –by pushing the patient’s foot and tibia down into the table, followed by internal and external rotation of the tibia. Pain on external rotation of the tibia indicates coronary ligament sprain. (With sprain of the coronary ligament, valgus stress test does not cause pain). Pain, crepitus, apprehension of the patient as the irritated surfaces of the patella rub over the femur. Therapist instructs patient to externally rotate the femur of the affected leg while performing active resisted isometric contractions of the quadriceps muscles at 0, 30, 60, 90 and 120 degrees of flexion. Structural Pes Planus = if medial longitudinal arch remains flat when the patient is standing on toes and when seated. Morton’s Neuroma (is a benign neuroma of an intermetatarsal plantar nerve, most commonly of the second and third intermetatarsal spaces (between 2nd-3rd and 3rd-4th metatarsal heads). This problem is characterised by pain and/or numbness, sometimes relieved by removing footwear. Sharp pain at the location of the neuroma. Pain is worsend by activity.